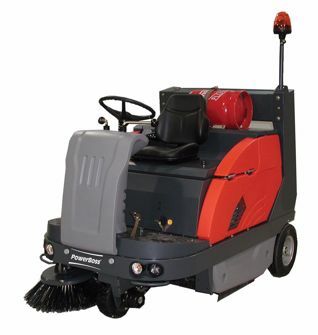 The PowerBoss Apex 58 is a versatile and high performing industrial sweeper. The 45" Apex 58 was designed with the operator in mind. It is equipped with a battery that is able to run for up to three hours per charge. The rider sweeper was designed with an ergonomically correct seating position to reduce fatigue and create an ideal view of the work surface allowing you to clean up to 110,868 sq. ft/ hr.